The Bundesliga is often a step ahead when it comes to groundbreaking training activities. Borussia Dortmund's famous Footbonaut has now been joined by Hoffenheim's Videowall as one of the league's latest revolutionary tools. BVB were the first Bundesliga club to introduce the Footbonaut training centre, a square-shaped arena where balls are hit to players at speed, forcing them to control in a short-space and pass back out into a target area. Hoffenheim are the only other Bundesliga club to use the Footbonaut. 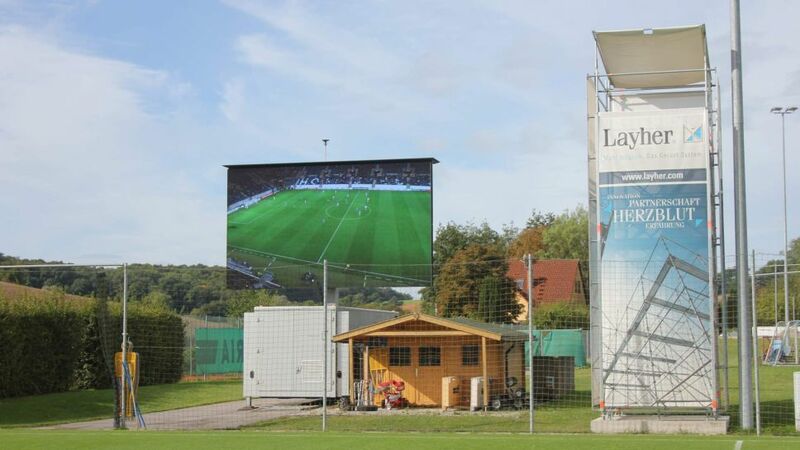 Now the Sinsheim-club also have a training technology of their own: the Videowall. Over the summer, Hoffenheim tested a 6x3-metre screen positioned on the halfway line of their main training pitch. The system works with four cameras, two from the tower, high above the halfway line and one behind each goal. The feed from each camera is able to be shown on the screen at any time. These cameras are controlled by the training staff, giving the opportunity for the film to be stopped, rewinded or fast-forwarded to show the players particular points of interest. It gives Julian Nagelsmann, Hoffenheim’s coach, the chance to explain situations in training in far more detail with four angles at his disposal. The trial period proved to be a huge success and since the beginning of September the club have been using a provisional – but still fully functional – screen at their training base in Zuzenhausen. It is also highly practical: the screen can be stored away safely in a container and can be taken out and ready to use within an hour. It can even be transported on a lorry to the club's training camps. "We can leave the players in their positions during most match situations, but still show them solutions," says Nagelsmann. "For this, I have an iPad in my hand that I can use to control the cameras. When I stop a situation, I have the opportunity to draw my solutions and suggestions for improvement all from the iPad." In December the final product will be delivered measuring a huge 40 square metres, which will dwarf the current 26 square metre version. Furthermore, it will be in full high definition, meaning the quality will surpass that of many big screens in stadiums across Germany. "We've tested the Videowall both during the day and at night, as well as in diverse weather conditions and we're very satisfied," said Rafael Hoffner, head of IT and sport innovation at Hoffenheim. "We're looking forward to having an additional technical innovation on our training pitch and we're convinced it will have a positive effect on our training sessions."